While the Minister for Immigration in the Whitlam government (1972-1975), Al Grassby, is widely renowned in politically correct Australian circles as the “father of Australian multiculturalism,” the real architect of this poisonously anti-White ideology and policy in Australia was Walter Lippmann, a German-Jewish refugee who settled in Melbourne in 1938. Lippmann was a businessman and a prominent member of Melbourne’s Jewish community who by 1960 had become president of the Australian Jewish Welfare and Relief Society. In an article entitled “Australian Jewry – Can It Survive?” published in the Jewish community newspaper The Bridge in January 1973, Lippmann argued that “The positive value of a multicultural society needs promotion in the Australian environment.” His argument was developed against the background of news that Lippmann found deeply disturbing, namely that “for the first time in the history of Australian Jewry, the 1971 Commonwealth Census has disclosed a decline in the number of Jews identifying as such.”[ii] Lippmann identified three major reasons for the decline: the post-WWII migration of Jews had mostly consisted of the middle-aged, the relatively low birth-rate of Australian Jews, and the relatively high rate of marrying out. Lippmann’s goal was to transform Australia from a racially and culturally assimilated White society into a multi-racial, multicultural society with wide variety of religions, cultures, and linguistic groups spread across the country’s landscape and accorded equal status by government. According to the Jewish Australian academic Andrew Markus, Lippmann’s basic message was: “that you’re not advantaging a specific group until you’re advantaging the whole society. You’re enriching the whole society. You’re freeing up potential, you’re freeing up human potential. Instead of people being locked away, denied opportunities, everyone benefits by opening up opportunities and by welcoming and recognizing diversity.” This vision of a new multicultural paradise where all kinds of racial, ethnic and cultural groups live in peace and harmony was laughably utopian, and heedless of the long catalogue of failed multicultural experiments around the world. 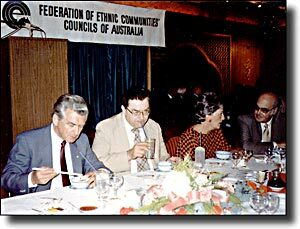 Through Lippmann’s membership and connections in the Australian Labor Party, he was appointed chairman of the influential Committee on Community Relations of the Federal Department of Labour and Immigration when it was established in 1974 by the Whitlam government. Lippmann also secured board positions on the Commonwealth Immigration Advisory Council, the Australian Council of Social Services (ACOSS), the Victorian Ethnic Affairs Commission, and a host of other bodies involved in shaping government policy. Lippmann was the most skilled of the multiculturalists at using his numerous committee memberships, both government and non-government, to gain tactical advantages in seeking to influence government policy. … Sometimes Lippmann used his position in several committees in a coordinated campaign such as his campaign for a closed seminar to articulate an ideology of multiculturalism. He launched the campaign in ACOSS [the Australian Council of Social Services], using his position as the Chairman of the ACOSS Joint Committee on Migrant Welfare to make a submission to the Immigration Advisory Council. This proposal was presented not as a Lippmann proposal but as an “ACOSS” proposal. He then used his position in the Immigration Advisory Council to argue for the acceptance of the ACOSS proposal. Once the proposal had been formally discussed in the Immigration Advisory Council it was presented to the Minister as an Immigration Advisory Council proposal. When the proposal was defeated due to a combination of ministerial indifference and opposition from senior department officers, Lippmann used his committee memberships to work towards establishing a place for a multiculturalist manifesto within the environs of the Department. The multicultural ideology that Lippmann so zealously and cunningly foisted on generally unreceptive White bureaucrats and politicians, and consequently on the Australian nation, amounted to support for everything that the organized Jewish community in Australia wanted—namely, official acceptance of the idea that ethnic groups in Australia should form their own communities, maintain their own distinctive cultural beliefs, languages and customs, and that government and taxpayers should support them in all of this. Under Walter Lippmann’s leadership and behind-the-scenes influence, the final report of the Committee on Community Relations in 1975 recommended that Australian government social policy be henceforth formulated on the basis of four key elements. 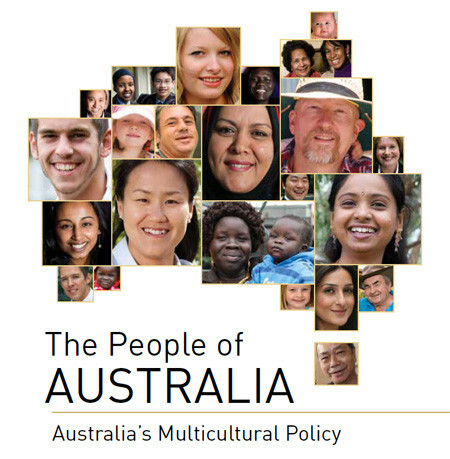 In response to the Committee’s (which were essentially Lippmann’s) recommendations, “multiculturalism” was adopted as official government policy in Australia in the 1970s, and extended under the Fraser [1975-1983] and Hawke governments [1983-1991] in the 1980s. Based on the premise that migrant problems stemmed from the low self-esteem they suffered in a society that was hostile to racial and cultural difference, multiculturalism launched countless government programs catering to ethnic communities, using taxpayer’s money to help them preserve their cultural practices and resist assimilation. The most expensive of these programs was the Australian multicultural broadcasting service SBS. If races and cultures really were as equal as multiculturalists sanctimoniously claim, then there would be no need to change the White Australian society and culture by introducing other races and cultures. That they routinely degrade White Australia and its traditional culture utterly belies their argument that all races and cultures are equal. Of course, the reality is that it is the very European-derived people (so loathed by the Jewish-dominated intellectual elite) which made Australia and other Western nations so successful in the first place. And it is precisely these people and their culture that the promoters of multiculturalism seek to destroy. The first Indo-Chinese and Vietnamese boat people started to arrive in Australia in 1976, and in the 1980s Chinese immigrants started to arrive in response to the discriminatory policies against the Chinese in Malaysia (i.e., failed multiculturalism). By the 2001 census there were approximately 170,000 Indo-Chinese in Australia, and Asians comprised approximately four per cent of the population. Ten years later the 2011 census has revealed a rapidly expanding Asian population, which, including those born in Australia, now easily surpasses 10 per cent of the Australian population. This Australian Jewish business, professional and media elite has been enlarged over the past two decades by the thousands of Jews who have fled the post-Apartheid South Africa that so many of them agitated to bring about—including the daughter of ANC activist Joe Slovo. By 2001, South Africans comprised 12.5 per cent of all Jews living in Australia. Suzanne Rutland notes that these South African Jews “arrived with a strong sense of Jewish identification and a very low intermarriage rate” and that “many are still coming, largely because of the high level of crime and a sense of insecurity”[xxviii] (another failure of multiculturalism). This experience has not, unfortunately, prevented many of the new South African Jewish arrivals from becoming actively involved in anti-White activism and agitation in Australia—proving, if anything, that their atavistic hatred of Europeans certainly runs deep. At the other end of the spectrum from the Jews and Chinese, significant numbers of low-IQ refugees from Africa (mainly Sudanese and Somalis) have arrived in recent years. They are almost totally welfare-dependent and are vastly over-represented, along with Pacific Islander groups, in conviction rates for violent offences. Multicultural activists routinely blame the social pathologies of these groups on White “racism.” Muslim immigration has also expanded in recent years, and Australian security services require ever growing budgets to monitor the activities of would-be terrorists from within this alienated and heavily welfare-dependent group. 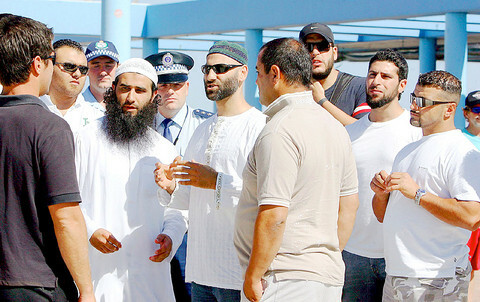 Gun crime among middle-eastern gangs has become a major problem in parts of Sydney and Melbourne. As a result of the weakening of Australia’s border protection laws by the current Labor government, Australia also has an increasing problem with illegal immigration by sea. Boatloads of Pakistani, Afghan, Iranian and Sri Lankan “asylum seekers” are taking advantage of what is effectively an open-door refugee policy to gain access to Australia’s generous welfare system. People smuggling from Indonesia (in close collaboration with ethnic communities and refugee advocates in Australia) has become a thriving industry. A recent attempt by the Australian government to deter illegal arrivals by arranging a refugee swap deal with Malaysia was torpedoed in the High Court after a challenge by the Jewish “refugee advocate” David Manne (nephew of Robert; see Part 2). From Walter Lippmann to David Manne, Jews have been, and continue to be, pivotal in driving the social and demographic transformation of the Australian nation. Fagenblat, M., Landau, M. & Wolski, N. (2006) ‘Will the Centre Hold?,’ In: New Under the Sun – Jewish Australians on Religion, Politics & Culture, Ed. Michael Fagenblat, Melanie Landau & Nathan Wolski, Black Inc., Melbourne. pp. 3-16. Jupp, J. (2002) From White Australia to Woomera – The Story of Australian Immigration, Cambridge University Press, Melbourne. Kallen, H. (1924; reprint 1970) Culture and Democracy in the United States, Arno Press, New York. Kelly, P. (2001) 100 Years: The Australian Story, Allen & Unwin, Sydney. Lopez, M. (2000) The Origins of Multiculturalism in Australian Politics 1945-1975, Melbourne University Press, Melbourne. Markus, A. (2006) ‘Multiculturalism and the Jews,’ In: New Under the Sun – Jewish Australians on Religion, Politics & Culture, Ed. Michael Fagenblat, Melanie Landau & Nathan Wolski, Black Inc., Melbourne. pp. 93-107. Rutland, S.D. (2005) The Jews in Australia, Cambridge University Press, Melbourne. Stratton, J. (2000) Coming Out Jewish – Constructing Ambivalent Identities, Routledge, London. 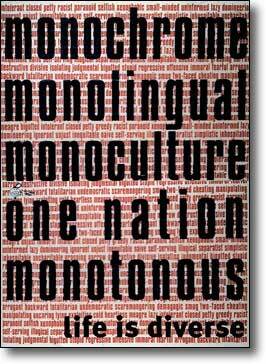 Tavan, G. (2005) The long, slow death of White Australia, Scribe Publications, Melbourne. Windschuttle K. (2004) The White Australia Policy, MacLeay Press, Sydney.